Now, I was impressed as much as the next man when the Super Nintendo finally made its way to these shores. When I saw Super Mario World for the first time I was in awe. When I saw Super Probotector I was scared witless, but still in awe. When I saw Shaq-Fu I was staggered by how bad a video game could be. But when I saw Pilotwings I was totally, totally amazed. This was a game and a half. 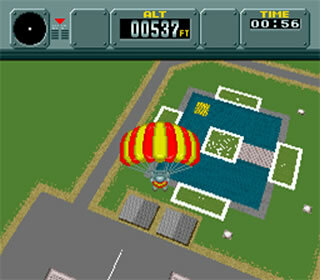 The biggest compliment you can pay Pilotwings, is that some eighteen years on from its original release, there’s nothing that’s even come close to replicating it – even with all the technical jiggery-pokery that today’s machines can provide. Even its N64 sequel – a truly fantastic game in its own right, can’t quite come up to its daddy in terms of pure nostalgic glee and class. A true advert for ‘less is more’, the objectives are simple. Use one four modes of transport (bi-plane, hang glider, rocketbelt and sky diving) to pass your flight lessons and move onto tougher and trickier stages with an Apache helicopter and earn yourself the Pilotwings. Now, all this sounds rather tame, but when put into practice the results are beautiful. Not one SNES game uses the Mode-7 graphics chip to such great effect – starting from the beginning of your descent, the screen is able to be swung around left and right with stomach-churning accuracy (warning : don’t play just after a heavy lunch). 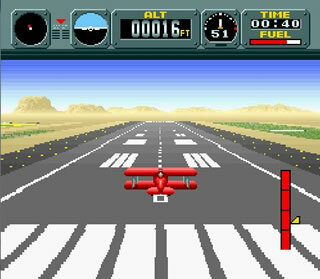 Because of the Mode-7 and the SNES’ ability to rotate and scale everything fully, it creates a superbly lifelike effect as the ground slowly gets closer and closer, and nothing gets the old pulse racing like those last few seconds when you’re desperately trying to get your little hang-glider down in one piece. Great sound is in evidence throughout, the windy effects especially adding to the atmosphere, and the presentation in general is top-notch. I can’t ever really recall a game being so relaxing to play, so able to make you feel like you are soaring through the sky gently whilst sitting in the comfort of your own home. Of course it’s not all tranquility and relaxation – the difficulty level is pitched just right, but it takes time to master and a fare few joypads have bounced off the ground over the years as my sky-diver did just the same thing seconds before. A think a few people were put off at the time by it being so hard to master (every slight move of your pad would seem to vastly change your direction) but to be fair, if it had been easy to get to grips with, the game could well have been all done and dusted in half an hour. All in all, it oozes class – no surprise considering it’s the child of Shigeru Miyamoto (the main man behind Zelda, Mario, Donkey Kong, Starwing and more). No one quite like Shigsy and Nintendo can take a simple premise and make it so utterly charming that you’re still excited about it nearly twenty years on. The rumours are that a Wii version may be imminently announced, if it proves to be the case, they’ve got their work cut out to better the original. Good luck fellas. OMG THERE WAS AN APACHE!! I used to play this at my cousins house every now and then and it WAS an intense game, but still held so much class. It was unbelievably difficult to master landing in the perfect spot whilst skydiving… yet I’d imagine this isn’t far from real skydiving so the game holds true. Many fun and frustrated evenings with Pilotwings.